The EVM hacking theory is flawed for several reasons. AAP had won nearly 96 per cent of the seats in the 2015 elections with precisely the same EVMs. Congress has since won 4 states using the same EVMs. If the machines were hacked, should re-elections be done? I was a candidate in the 2014 Lok Sabha elections, and few days before the poll, scores of our volunteers were called for ‘EVM checking’. They were allowed to select machines randomly and press buttons multiple times to confirm that their votes were being registered correctly. Some volunteers pressed an assortment of buttons across various machines, and each time the result was correctly registered. Of all the machines we tested, only one proved to be faulty—when volunteers repeatedly pressed the button against my name, the vote was transferred to a nondescript independent candidate. As soon as we pointed this out, the officer promptly replaced the machine. That’s when I came to understand the kind of rigid standards and care that was taken by the independent EC to ensure that elections were fair. Even if there happen to be a few faulty machines, this does not amount to a case of massive rigging. Maybe some machines might be sending that faulty vote to a BJP candidate. To discredit out EC and democracy based on some faulty machines is undermining our country. 5 Machines are individual sets (like a calculator, using its own algorithm) that cannot be influenced from outside, by wi-fi etc. Therefore EVM cannot be mass influenced, nor changed without physical contact with each individual machine. During the 2014 Lok Sabha elections, 9,00,000 EVMs were being protected day and night by the Central Reserve Police Force (CRPF), election officers and political workers across all parties. To suggest that EVMs, despite being under such scrutiny, were having their motherboards tampered with was unrealistic. 7 As a corollary, there were thirty-four lakh permanent and temporary employees as part of the election exercise. It is impossible to conceive of any party being able to arm-twist all of them into ignoring physical manipulation of EVMs. India is a noisy, contradictory nation and not a homogeneous political group and even a small group of 4/5 people would have different political opinions. So, lakhs of people keeping quite or complicit in this is not correct. Some whistle – blower could have exposed if there was something hidden. Many retired Election Commissioners have been anti-govt, but no one has made any such ridiculous claims. 8 In several constituencies across Punjab and Goa, where AAP made allegations of the ruling party hacking EVMs, the maximum seats went to the Congress. Did the BJP manipulate the results so the Congress could win? 9 In many of the cases, opinion polls and especially exit polls have been reasonably accurate. But opinion poll and exit polls are not made on EVM, why do they match? I had done some serious study of EVM and their possible misuse in 2017. The results of all the 1,642 polling stations in the 40 assembly seats of Goa as well as those in 33 assembly seats in Punjab that had VVPAT (voter verified paper audit trail)—an independent verification method in a ballot-less voting system which allows voters to check that their vote has been cast correctly. Connected to the EVM, the printer-like apparatus generates a receipt indicating the symbol and name of the candidate a voter votes for. After being visible to the voter from a glass case in the VVPAT for some seconds, the ballot slip is cut and dropped into a drop box in the VVPAT machine and a beep is heard. VVPAT machines can be accessed by polling officers only. The VVPAT rolls are taken out for counting only if a candidate, his election agent or counting agent (in the candidate’s absence) applies in writing to the returning officer (RO) to count the printed paper slips in any or all the polling stations. 1 As per counting data of the 33 VVSAT constituencies of Punjab, the Congress got the largest number of votes in 20 seats, followed by SAD (ShiromaniAkali Dal) and AAP which emerged victorious in 6 constituencies each. A lone seat went to the Lok Insaaf Party. This showed little variation with results in other constituencies having EVMs without papertrail. As we know, while the Congress emerged as the single largest party with 77 seats, AAP got 20 seats and SAD secured 15 seats.
. Neither AAP’s candidates nor AAP itself approached the courts with their complaints, which should have been the obvious course of action.
. When the EC, to call the opposition’s bluff, scheduled an open hacking challenge for EVMs, the opposition did not participate. Instead, it sought permission to physically handle the EVM and change the internal circuitry of the machines, which was turned down by the EC on grounds that it was ‘irrational and implausible’. The hue and cry against EVM is just a drama. In my next round, I shall write about who and why are some people trying to discredit EC. 1) Malathi Shetty - Age 63 - Charitable Hospital (Successful ) was suffering from a lymphoma cancer in tonsil and needed chemotherapy, urgently. While she was staying in a slum in Mumbai, her son stays in Manglore. He could not come to see his ailing mother but sends 3000 rupees per month for expenses. She took 1 chemotherapy in Pune but it cost around Rs1,00,000 which she paid with help of relatives & her Community. Our volunteer Suresh Acharya followed up brilliantly and accompanied the patient everywhere and helped till the end. Thanks Suresh. Malati has been admitted to Hinduja Hospital as an Indigent patient after the intervention of Nation First. She will be getting 8 chemotherapy treatments (worth Rs. 1,00,000 each) of around 8,00,000, completely Free. So happy. 2) Prasanna Kavale - Age - 10 Month old baby - Charitable Hospital (Successful ) is suffering from a congenital heart defect. Prasanna stays in Sindhudurg, father is a small farmer who earning is not fixed and mother is housewife. Nation First requested Kokilaben Hospital to admit the patient as an Indigent patient and treat him free of cost, to which they have agreed. And while admitted as an Indigent patient, the family has also been asked to approach the CM Relief and other charitable Trusts, as the hospital claims it is running a negative balance in their IPF account. On 8th of December baby got admitted and on 12th of December, the surgery was successfully completed. We all sighed with relief. A life saved and a family saved too. Thanks to all the doctors. Our dependable and best volunteers, Rahul and Mitali made this possible. What a fabulous team. 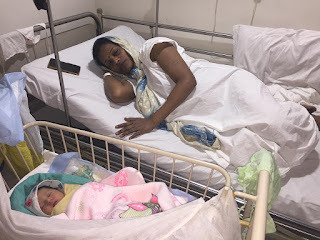 On 3rd Dec. Rajani Mhatre delivered baby girl and suffered unstoppable bleeding. She was shifted to Nanavati. Her HB dropped to 4 and she was critical. Hospital authorities performed immediate blood transfusion and corresponding treatment. Hospital gave an estimate of 184000 rupees. Rajani’s husband is unemployed and annual family income is just 65000 rupees. Our volunteer Sonia Punjabi coordinated with her mother on behalf of Nation first. On our request, she was treated as an indigent patient in Nanavati, free of cost. She was discharged on 11th, hale and hearty. Thanks Sonia. Suffering from a Dual stricture in a urethra. He did his test in K. J. Somaiya Hospital but his treatment is not cover in MJPJAY. then we referred him to Lilavati Hospital. We are waiting for documents and will get a date for an admission. Shrinivas, our sincere volunteer is following up. In the past week around 12 calls of new cases were received through which we have informed about this Schemes. Suffering from a lymphoma cancer in tonsil need chemotherapy. Now the treatment process is going on in Hinduja Hospital. Suffering from a Kidney stone (both the kidneys) Treated in Malika Hospital in MJPJAY scheme. Left side surgery was done. Right side operation will be done in Dec. 2018. Suffering from a Dual stricture in a urethra. He did his test in K. J. Somaiya Hospital but his treatment is not covered in MJPJAY.He has been referred to Lilavati Hospital. Waiting for documents and will get a date for an admission on 12th December 2018. Suffering from a congenital heart defect. Wadia Hospital refused to do surgery because there is a high risk. Kokilaben Ambani hospital has admitted. While Kokilaben Hospital will treat, they have asked the relatives to apply for CM and PM funds. Suffering from Right DACA Aneurysm now treated in Nanavati Hospital under Charitable Hospital scheme. last week he started receiving free treatment under the scheme but they asked for bye medicine from outside. We spoke with Social worker now from last 2 days he started giving medicine under the scheme. Suffering from a Kidney stone (both the kidneys) Treated in Malika Hospital in MJPJAY scheme. Left side surgery was done. right side operation will be done on 1st Dec. 2018. Suffering from a lymphoma cancer in tonsil need chemotherapy. we asked them to go to the BSES hospital and meet Arogyasevek of MJPJAY scheme because we got information from the MJPJAY helpline this treatment is available in BSES Hospital, however, the hospital denies for the treatment from both the scheme (MJPJAY & Charitable Hospital). Now we are working on this. 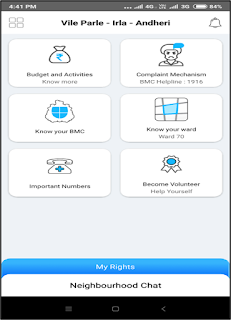 A unique, first-time-in-the-country tool for govt-citizen interface prepared by UPL Ltd and Shroff Family and social activist Mayank Gandhi with the support of the elected representative of ward 70 of MCGM, Mrs Sunita Mehta. Decentralization: The 73rd amendment (1991) for decentralization of power in rural India has led to the creation of the Panchayati Bill, which has substantially improved governance in rural India. But there is an equal, if not more, need for decentralization in urban governance as per the 74th amendment. Urban disconnect: Urban citizens have shortage of knowledge and involvement in the workings of local government. Government working: Gap in communication between the govt machinery and the citizens reduces the performance of services and leads to discontent among citizens. A model App has been created for one of the 227 municipal wards of MCGM to address the above concerns. This is an honest and non-political attempt to create a model for integrating urban citizens of India with the governance of their locality. This can be done by sharing of necessary information with citizens, involving them in day-to-day governance and empowering them with knowledge and data in an easy-to-access and user-friendly manner. This will serve as a model, which can then be replicated across various urban areas. Ward budget – details of works planned, work-in-progress and completed works VIA 70 ward. The app will allow citizens to rate the civic works done and also make comments on its quality and timelines. They can also suggest fresh work to be undertaken in the ward. Complaint mechanism – Citizens will be empowered with information about the officers to whom civic complaints can be made with the necessary timelines. Escalation of complaints in case of failure to solve the complaints will be part of the App. MCGM data – a complete data tree with various departments of the MCGM. Ward data – Complete data of education institutes, health institutes and open spaces with Google map. Important numbers can be accessed to report complaints in various other forums like Police, Traffic Police, Anti-corruption, elected representatives etc. Volunteering opportunities in the ward. Neighborhood chats – there will be multiple chat groups to encourage citizens to chat and discuss local civic issues. My endeavor is to transform rural India by creating a replicable model using technology and new techniques. The drought this year in Marathawada has thrown in an intense challenge to put in place sustainable and long-term solutions. These solutions should be able increase income by ten times in the next five years and insulate farmers from these periodic droughts. We are embarking on creating a lasting solution by planting 10,00,000 fruit trees across the taluka in the next monsoon. This is over and above, ensuring supply of drinking water to all the 106 villages in Parli Taluka, Beed. On the 3rd, 4th and 5th Dec ’18, we intend to take over 200 farmers who are interested in horticulture from these 106 villages for field visit and technical presentations and lectures to Jain Hills, Jalgaon. Jain Irrigations is India’s finest company with multiple agronomists and scientists in the field of agriculture and horticulture. 2. Water requirements (month wise) for each of the fruit plantation options. Drip irrigation and its costs and subsidies. Sourcing of water. 3. Economics, income and expenditure, profitability, time for production to being, which months will fruition take place, any inter-cropping solutions? 4. 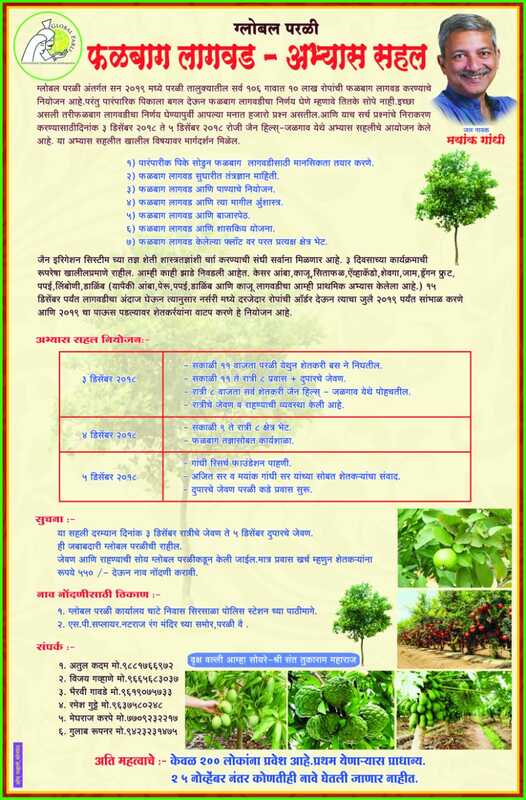 Marketing plans for each of the fruit plantation. Is there a buy-back arrangement for any fruits? What is the pricing? 5. Quality and varieties of saplings and fruits. Advantages and disadvantages of the same. Soil testing and quality parameters. 6. Government subsidies and documentation for the same. 7. Regular training, exposure visits and responding to technical challenges.